Minus the heels, this is a look I repeat over and over throughout the week. Working from home allows me the freedom to dress as comfortably as I want, and while it’s certainly tempting to stay in Lululemon all day, I like to get ready and look cute. It’s always nice when I can dress up what I’ve been wearing all day with just a quick change of my shoes! I wore this look from my desk to dinner with a couple girlfriends a few weeks back. It’s incredibly comfortable, but with the right accessories it looks elevated and ready for a night out. This twist-front tee is an effortless closet staple, and at $22, you can buy every color! For a more casual style, I really like the almost textured look a slub jersey tee can bring to the table. I have a similar one from GAP (old!) that I wear all. the. time. The special tie-front detail on this Wilt tee takes it from boring to anything-but-basic. 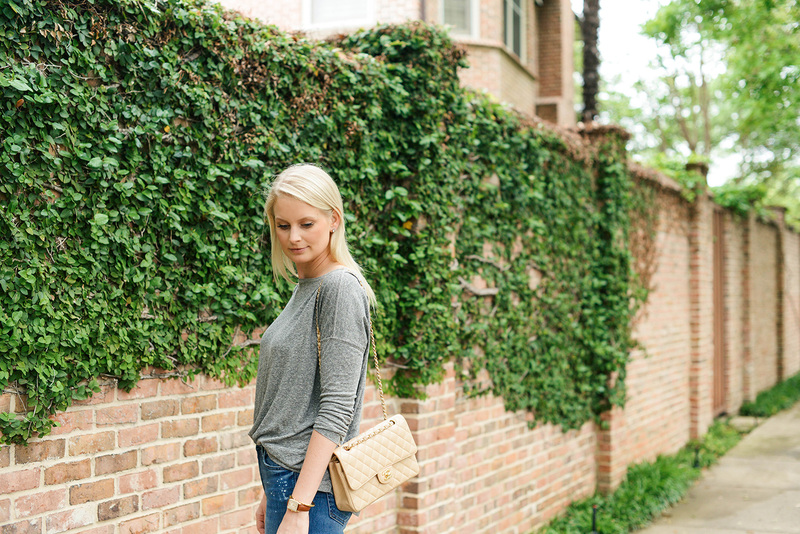 This crewneck style is a classic you can wear with just about anything (and under $20!). A navy + ivory striped tee is an essential you can wear year-round! Love this boatneck style from J.Crew. Current/Elliott also makes some amazing, soft t-shirts. This short sleeve tee looks a lot like the one I’m wearing here! PS – this is the other pair of MOTHER jeans I picked up recently. They are SO comfy! I love the subtle splatter paint detail near the pockets and slightly distressed look of them, don’t you? I love this casual outfit! So easy and laidback! I really do like that tee! Love the wash of these jeans, I have to try them. A girl can never have too many solid tees! Love this one. It looks like it’d be so comfy! You can’t go wrong with a gray tee! Love this casual look. And this location is so beautiful! You always have the best photos!! Love the twist front tee, gonna have to pick that up. Also, I love plain Ts from Everlane! So soft and really cheap too.